* The full-color Hero's Guide, which ecplans how to create heroes; it also takes you on a brief tour of the DC Universe and describes the basic rules of the game system. 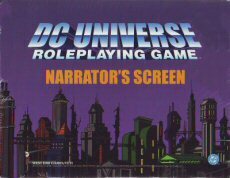 * The two-color Narrator's Guide, which teaches you how to become a Narrator, with optional rules, details on creating new equipment, and introductions to some of the more legendary heroes, villains, and other important people of the DC Universe. * A solitaire adventure featuring Robin that demonstrates the game system, and a full-length adventure set in Metropolis that can kick off your super-hero exploits." Contains 5 Hero Dice and 1 Wild Hero Die. Fight Crime with the World's Greatest Heroes! 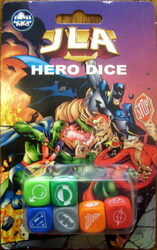 Each blister contains 7 JLA Hero Dice: 6 regular Hero Dice and 1 Character Point Die, which has 1 critical success. 4 successes, and 1 failure - perfect for rerolls of Wild Dice and using Character Points (see pages 102-103 of the rulebook). * A Narrator's screen — vibrantly colored on one side, eerily black and white on the other — stuffed with all those most-referenced charts! * New Advantages, Disadvantages, and game mechanics! * Dramatic Effect Cards to enhance roleplaying in your super hero adventures! * Tips on designing dynamic characters! * Suggestions for crafting thrilling adventures! * Generic people, places, and encounters to improve scenes! * Arkham Mayhem — a collection of scenarios that sets your heroes against some of Arkham Asylum's most dangerous inmates! * An index to this book and the DC Universe book"
"The 96-page, two-color Metropolis Sourcebook contains information on the major locations and organizations in the city, the people who populate its streets, the villains who show up there, new and optional rules for the game, advanced equipment creation rules with powered armor descriptions, guidelines for creating your own super-hero city, and an adventure featuring two of Superman’s most notorious foes. 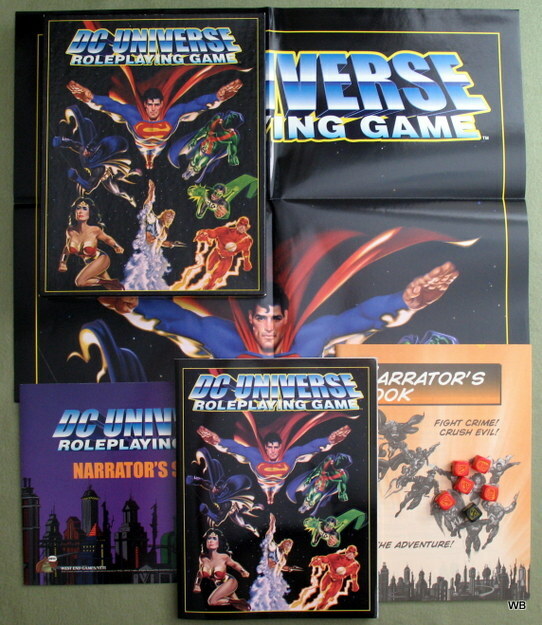 A great resource for comics fans and a supplement for the DC Universe Roleplaying Game." 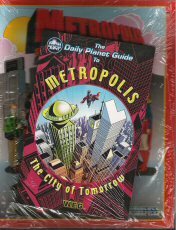 "The Daily Planet Guide to Metropolis is the source for information on the historical City of Tomorrow. Included within you will find information on the best restaurants, hotels, parks, places to live, and things to do in the city. It also contains a history of the city and a guide for metahuman watchers. A great resource for comics and game fans alike! A supplement for the DC Universe Roleplaying Game." "This supplement includes detailed information on the current roster of the JLA and the JLA Watchtower. It also contains facts on the founding members of the JLA, the members of Young Justice, the bases of these two teams, and the adversaries of these incarnations of the JLA. A supplement for the DC Universe Roleplaying Game." 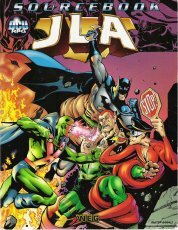 "The JSA Sourcebook covers three generations of super-hero teams -- the original Justice Society of America, Infinity Inc., and the new JSA -- along with their allies, enemies, and equipment. • A history of each team, spanning over six decades. 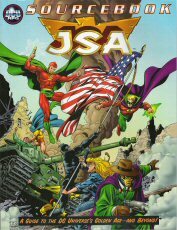 Justice Society of America; All-Star Squadron; Freedom Fighters; Seven Soldiers of Victory; Young All-Stars; Infinity Inc.; The new JSA. • A look at some of their greatest villains. • A tour of each team's base and an overview of their equipment. • A Narrator's section on the 1940s. • A new adventure set during World War II that has the heroes searching for items from the time of Camelot. A great resource for the JSA and Golden Age comics!" • Details on over 100 heroes, villains, and ordinary people of Gotham City and Blüdhaven. • Descriptions of some of the city's most notable locations and organizations. vehicles, and hideouts of Batman and his close allies. • New and optional rules, skills, and Dramatic Effect cards. • A lesson in including natural disasters of all sizes in your campaigns. • A chilling adventure centering on an experiment by the doctor of fear, the Scarecrow. Written by Mark Barnabo, John Goff, Fred Jandt, Scott McCullar, Aaron Rosenberg, Jim Spivey, Sean Taylor. Art by Ariel Olivetti, Sergio Carielio, Tomm Coker, Tom Grindberg, Yvel Guichet, Doug Wheatlev, and more!" 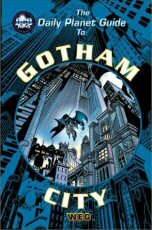 "This travel guide features everything a visitor needs to survive in Gotham City after "No Man's Land." It offers a history of the city and descriptions of its neighborhoods and corporations. 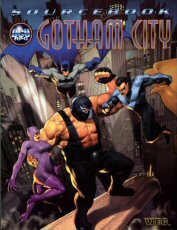 It also includes is information on the best activities, restaurants, and hotels that Gotham has to offer. A great resource for comics and game fans alike! 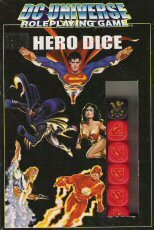 A supplement for the DC Universe Roleplaying Game." "Come explore the mysterious world of magic in the DC Universe. 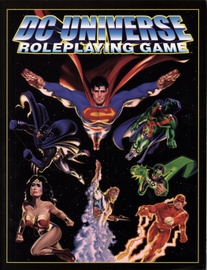 With this supplement to the DC Universe Role laying Game, you can become part of a world where magic is more than a sleight-of-hand trick, where moving objects at a distance is not done with science or an active metagene, but by controlling powerful, unseen, fickle forces. Delve into a new method of creating magic-wielding characters in your game. Specially designed Advantages and Disadvantages offer even more options for those who choose to learn the arcane arts. Similarly, new character creation packages provide a base for making your own enigmatic beings. Too vast for a single power to hold, the new Manipulation power subclass Magic Manipulation encompasses the new powers of Wizardry and Sorcery. 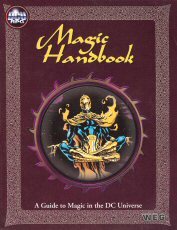 Also find new Enhancements and Limitations, all of which relate best to Magic Manipulation powers, but some of which are suitable for any other class of power. Naturally, as the Magic Manipulation power has been expanded, so has the spell-casting method become more detailed. This book thus also guides readers in the intricate process of designing a spell — and the delicate art of casting it. Become acquainted with magic-wielding characters and paranormal beings. You'll find an eclectic mix of more than 60 characters from current DC Universe continuity. You'll also discover the secrets of over a dozen rare and mystical artifacts, as well as how to devise your own." 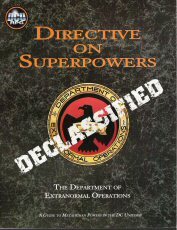 "The classified files of the covert government agency the Department of Extranormal Operations are finally released. The public can now take advantage of the data accumulated from the D.E.O. 's years of studying metahuman powers and activities in the DC Universe. This document expands on previously published material on powers. Get introduced to new ways of determining initial power cost, using Character Points and Hero Points with powers, and more. Find out how wonders and androids affect power selection. Learn more about new and revised limitations and enhancements. Discover a wealth of information on powers (new and updated), so many details that it took a whole book to contain them all." "The material contained within this manual is to be considered highly classified. Inside, you will find briefings on our top personnel, select resources available to you in the field (with proper authorization, of course), and our main headquarters. Also contained within are metahuman file forms, reference information, a mission log, and other useful materials." 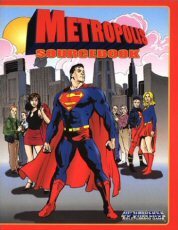 2-book set includes: Metropolis Sourcebook (WEG 52004) & The Daily Planet Guide to Metropolis, City of Tomorrow (WEG 52005).